60 riders (out of 64 who started) successfully completed the Bury 55 miles Olympic Year Sportive on Sunday 19 August 2012. Although not a race, the rider who finished in the fastest time was John Harrison who clocked in at 3hrs 2mins, just missing out on going under the 3 hour mark. All finishers received a specially minted ‘gold’ medal. For interest, all finishers, and their times, are listed below - click on the link. Of course many riders made cafe stops en route, so in many cases actual cycling time would be much less. Everyone was home within 5 hours. Thanks must go to Castle Leisure Centre for letting use use their foyer for the registration and start and to Vicki of the Barista Cafe Bar on The Rock for hosting the finish. Thanks of course to all entrants for their participation and helping to raise £300 for the British Paralympic Association. Also thanks to the checkers, Christine Duckworth and Dave Woods, for their diligence. The event was part of the national 'Join In UK' campaign to run sporting events on the weekend between the Olympics and Paralympics. Peter sets a group of the 64 entrants on their way. Peter sets another group of riders off. 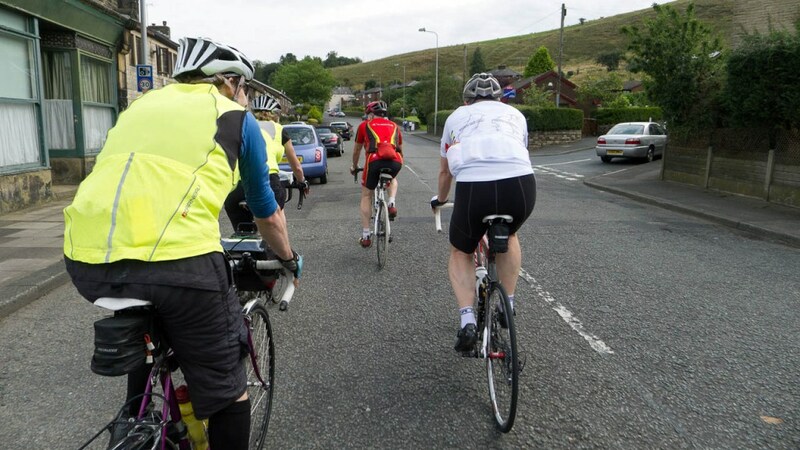 Riders on the lower slopes of the Blackstone Edge climb. A group of riders outside the Barista Cafe Bar having just completed their ride.